The clock on the wall of my studio tells me that it is 8:12. A week ago at this time it would have been 7:12. This large clock, that also shows temperature and humidity, is run by a little double A battery and its hands, its hours, its minutes and seconds are not connected to the internet. This means that when we move our clocks back or forth an hour in response to Daylight Savings Time the clock on my studio wall doesn’t change automatically while the clock in my phone changes while I sleep. Time is a big deal. Where the sun is at any particular moment of the day or night is a big deal. But most of us forget this. I do. At this moment of time I’m trying to imagine before something like 1883 when towns set their own clocks to when the sun was highest at noon. I’m going to do my best to not make a big deal about this but with just a little bit of thoughtfulness anyone of us can spend a few minutes to reflect upon our own personal relationship to time and the activities that we engage in while we flow through time. A few examples include getting off the highway and traveling the backroads will alter our sense of time. For those of us who have been in a car accident we know that sense of time slowing down along with every detail being amplified. Being in love changes our perception of time. (Just think about the last time you took the time to write a love letter or call someone you didn’t have to simply to say thank you or I love you.) I can’t tell you how many times I’ve discussed time with a waitress. Most recently a wonderful waitress at the Hilltop Restaurant in Spencer, Indiana explained that she would rather have it busy than slow because it makes the time go faster. I could go on and on as could you. But the thing about Daylight Savings Time is that it is in our face. And we can’t exactly explain it. I realized this when my daughter asked me about it and I stumbled around with an less than adequate explanation. I did some research but I can’t really explain any of it with any satisfaction – except for the fact that I do know my experience of time passing is continually in flux. This much I can say. I will add only this: I went to Cincinnati this past weekend. I had work to do but I made time to get over to the Cincinnati Museum of Art up on Mount Adams. Now, I’m sure I missed a whole host of cool spots but I didn’t have much time. So I got up there and ran through the galleries. I found beaucoup beautiful stuff everywhere. I learned more than I can say. I actually found myself in tears a number of times in the hour I was there. And in the midst of it all I found, in a little cramped space of a transitional gallery a tempera on board painting by Andrew Wyeth. 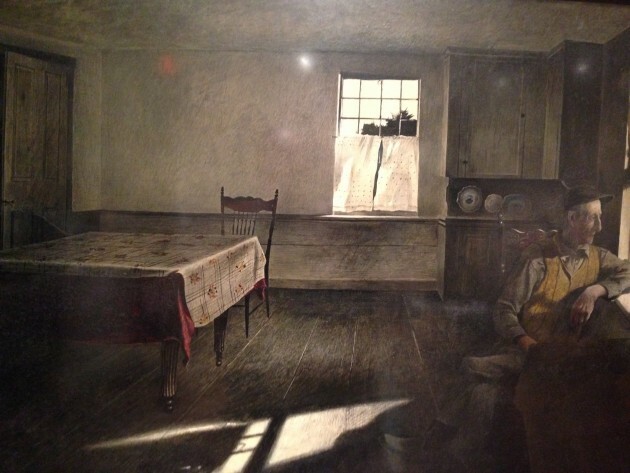 I really don’t know anything about Andrew Wyeth except he never got on my list of “It” artists. Silly me. The guy was focusing on what was around him – leaning into where he lived, investing in what he saw, connecting with who he knew. I stood in front of that painting (titled “Portrait of Henry Teel done in 1945) and time stopped. All my rushing about stopped. I could feel the beating of my heart. There is plenty I don’t like about the picture and plenty I love about the picture. For example I love the dark shadow behind the plates. I’m not trilled about the stage set cropping of the scene. I love the dirty looking area beneath the center window. The perfect alinement between the legs of the chair and the legs of the table is unsettling. And, I love the sparse space behind the kitchen table. The ambiguity in me about this picture feels perfect. I love this. When I was a younger artist I was completely absorbed by the idea that something, some object or image, could be “timeless”. I studied timeless things that were identified as such by experts without really getting any of it. Believe me I can tell you from an art historical perspective why stuff made at this or that point was and is important. But last Saturday, during an hour long visit to the Cincinnati Museum of Art I finally figured out what “timeless” means. Something is “timeless”, for me, when you experience a pause inside yourself when you come upon that thing. Each one of us finds our own way to timeless moments. It all doesn’t happen in museums or on exotic vacations or when we’re fiddling around our clocks, moving their hours back or forth. But I’m pretty sure that something timeless is happening right here inside our houses, apartments, somewhere at work, somewhere on the way to work, and between us and those we love.